“If you’re playing for ante, you cut her deck while she cuts yours, and you both turn over the top cards of each other’s decks and set them aside as the ante cards. Whoever wins the game will keep both cards.” – From the “Sample Game” in the Revised Starter Pack Rulebook. Ante was one of the core principles when the game was founded, but as the game grew out of its infancy ante no longer remained a core a part of the game, at least not the sanctioned game. As Revised gave way to 4th edition and eventually the Ice Age block Ante cards’ last hurrah came and went in Homelands without much fanfare. But by then the game had changed. Cards had become expensive and Wizards of the Coast’s governing professional tournament entity DCI (formerly Duelists’ Convocation International) made the decision to ax ante as a rule and make it an optional part of the casual game, removing it completely from the professional game (Pro Tour). Why was it great? It was the best equalizer that ever existed in Magic. 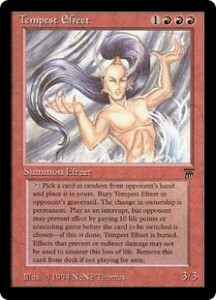 It promoted a whole slew of commons decks, which everyone could equally build, because of each deck’s low cost. It also made those players not using commons decks think twice about stuffing their decks with rare cards. All of this strategy was a part of the deckbuilding process because the threat of losing more than just a game [read cards] had that kind of a huge impact on the game itself. 407.1. Earlier versions of the Magic rules included an ante rule as a way of playing “for keeps.” Playing Magic games for ante is now considered an optional variation on the game, and it’s allowed only where it’s not forbidden by law or by other rules. Playing for ante is strictly forbidden under the Magic: The Gathering Tournament Rules (WPN.Wizards.com/en/resources/rules-documents). 407.3. A few cards have the text “Remove [this card] from your deck before playing if you’re not playing for ante.” These are the only cards that can add or remove cards from the ante zone or change a card’s owner. 407.4. To ante an object is to put that object into the ante zone from whichever zone it’s currently in. 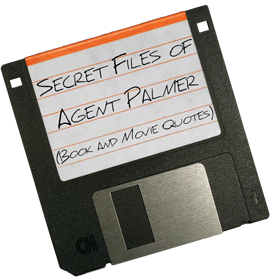 The owner of an object is the only person who can ante that object. However, ante is now forbidden in DCI-sanctioned play, and is only allowed in casual games where not forbidden by law. Because if ante were a rule in Pro Tour events, official Magic: The Gathering tournaments would be governed by the same laws that oversee gambling, which wasn’t the way Wizards of the Coast wanted the game to be seen. Especially a game rooted in the youth market. However, on the plus side, playing for ante also opened up nine cards. Cards that can help you win the game, double your spoils of victory or just take ownership of a card regardless of the game’s outcome. Let’s take a look and the Ante Nine. All of these cards had “Remove this card from your deck before playing if you are not playing for ante,” printed on them. The most potent of all nine ante cards, Contract from Below costs one lone Black Mana and you discard your hand in exchange to draw eight new cards with the first drawn being added to your ante. But it’s a brand new hand for one Mana, making it 233% better than the three card draw of Ancestral Recall! Although many give Recall the nod, because it is an Instant, this Sorcery is still quite potent. 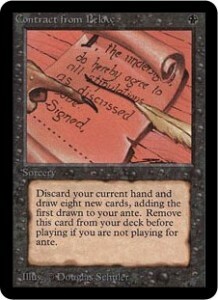 If it wasn’t an ante card Contract from Below would never have been printed, because it would have been deemed too broken. That’s the power of ante. Darkpact is a Sorcery costing three Black Mana to cast allowing you to switch the top card of your library with your ante card. This was great if you knew what the top card of your library was, via a Sylvan Library for example, but depending on what your ante card was, it didn’t matter. If you could use your ante card for a winning or lockdown combo to win the game outright, you knew it was worth the risk. But unless you won the game with your ante card, it was still a risk. Darkpact’s switch wasn’t always a guaranteed win. 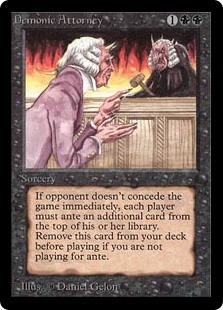 One of the most fun ante cards in existence was Demonic Attorney. Now, I’ve never known of any situation where additional cards were not added to ante. If you had it in your hand and were losing, you just didn’t play it. But if you were winning, it was like doubling down. After all, Spoils of War are best when there are more of them. Another variation on the ante switch was Jeweled Bird. 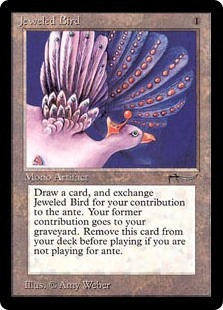 For one colorless Mana this Mono Artifact allowed you to draw a card and replace your current ante with Jeweled Bird. Your original ante going safely back into your graveyard. It’s dual purpose of ante switch and card draw meant that most players who played for ante, had as many of these in their collections as they could get their hands on. It was truly the standard staple card of any ante deck that wasn’t a straight up commons deck and even some that were. 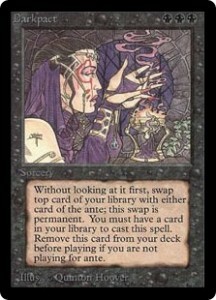 It was also the first Artifact ante card and by default of that, the first non-Black ante card. This expensive Mono Artifact cost six colorless Mana and enabled a player to take a card even in defeat, or two in victory. It allowed the player to remove “any card opponent has in play” from the game. The chosen card was now yours and the Bronze Tablet now theirs, safely buried in their graveyard. This exchange could be countered if your opponent “spent 10 life” which like loss of life and unlike damage, could not be prevented or redirected. Thus it usually succeeded and therefore most of the time guaranteed you a spoil of war even in defeat. Or with the loss of life it could turn the game in your favor. 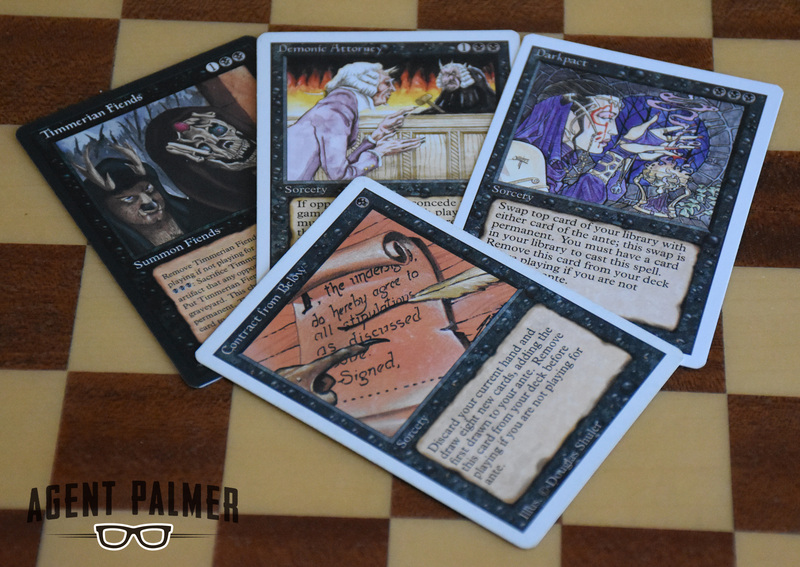 It could also turn a game if not countered, depending on the card in play you chose to take. No matter which happened, the card exchange or the loss of life, Bronze Tablet was an effective game changer. I can’t help but enjoy the first line of the rule text of Rebirth, Green’s first and only ante card. But it’s interesting because unlike every other ante card, it equally effects all players. And if both players take the healing, it resets the game. However, if you were down to a single digit life total and your opponent was near 17, it would make sense that they not ante an additional card for a mere three life. 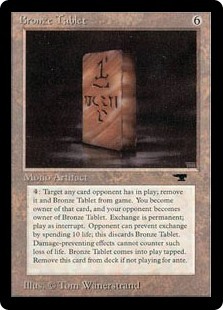 The first creature and first Red ante card was not a switch card for ante, it was a switch card period, taking it’s lineage from Bronze Tablet. The difference being you randomly selected a card from your opponent’s hand and placed it into yours, while burying Tempest Efreet in the opponent’s graveyard, a permanent swap. This could also be countered with your opponent chosing to pay 10 life. 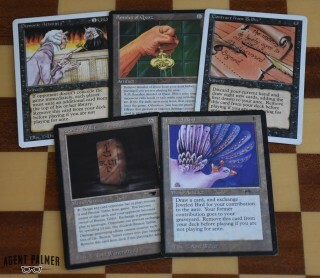 And if you had the Mana available, or of compatible colors, you could effectively beat your opponent with their own card, the Magic: The Gathering equivalent of beating them with their own shoes (which are now yours). That was it’s main purpose, because otherwise it was just a one colorless and three Red Mana costing 3/3 with no other abilities. This six Mana casting cost Artifact was the ultimate in gambling if it wasn’t countered. 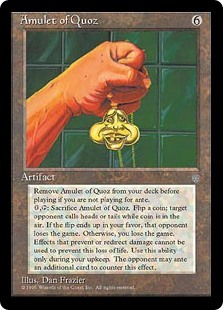 Sacrifice Amulet of Quoz and flip a coin while opponent calls it. Whoever wins the coin flip wins the game. But as a twist, your opponent can counter this effect by adding a card to their ante. They must choose to do this before the coin flip, not after. It’s the ultimate “do you feel lucky” play. It’s also one of the few magic cards that has a zero Mana symbol before the tap symbol. Timmerian Fiends was the last ante card printed in Magic: The Gathering and only the second ante card that was a creature. 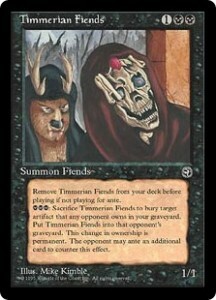 As ante cards go, Timmerian Fiends was not a high note for the end of an era. Like Tempest Efreet and Bronze Tablet it was a switch card, but unlike those two it only switched your Fiends with an artifact. Also, it could be countered by your opponent adding another card to their ante, no loss of life here. And to round it out it cost one colorless and two Black Mana to cast, but three Black Mana to activate. All in all, probably the worst of all nine ante cards. But it wasn’t the reason ante disappeared from the game! Magic cards have become more like investments than gaming pieces over the last decade making ante extinct, joining the ranks of Mana Burn and Interrupt cards. In the modern game, it just doesn’t exist and it is hardly missed. 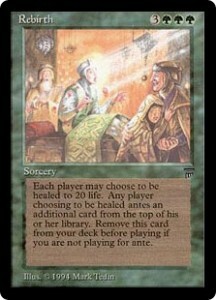 But for old school players ante was a badge of honor. It was the closest Magic ever came to Russian Roulette. That may seem a bit excessive, but if you’ve ever had to ante an extremely rare and valuable card, you know it is not. Yes, it was gambling, but it was also about pride. Putting your deck where your mouth was so to speak. And the juice was always worth the squeeze. Bragging rights are great, but spoils of war are better and they last longer, too! Fa6got how dare you miss that piece of sh1t mechanic phuck you.